By all accounts, the LSE North America Forum held in New York on May 15 was a resounding success and was attended by more than 350 alumni, staff, friends and colleagues. Director Craig Calhoun gave an inspiring welcome address with lots of news from LSE. 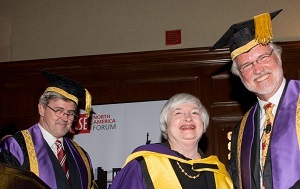 The highlight of the event was a ceremony conferring an Honorary Doctorate on Dr. Janet Yellen, Economist and Chair of the Board of Governors of the Federal Reserve. All stood to applaud Dr. Yellen during the procession and following her heartfelt remarks. Professor Peter Trubowitz, Director, US Centre and Professor of International Relations. Patrick Mears, Chair, Alumni Association, (LLB, Law,1979) presented the Distinguished Alumni Leadership Award to Richard Goeltz (General Course, Economics, 1963), LSE Benefactor’s Board donor and North American Advisory Board member. North America Forum, May 15, 2015. Dr. Janet Yellen is featured in some photos. AFLSE President Tom Kern, AFLSE Chapter Coordinator Connor Galvin and AFLSE New York Social Events Coordinator Chris Bodell are included in other photos.